Born into a Newcastle coal mining family, Charles Hutton (1737-1823) displayed mathematical ability from an early age. He rose to become professor of mathematics at the Royal Military Academy and foreign secretary of the Royal Society. First published in 1795-6, this two-volume illustrated encyclopaedia aimed to supplement the great generalist reference works of the Enlightenment by focusing on philosophical and mathematical subjects; the coverage ranges across mathematics, astronomy, natural philosophy and engineering. Almost a century old, the last comparable reference work in English was John Harris' Lexicon Technicum. Hutton's work contains many historical and biographical entries, often with bibliographies, including many for continental analytical mathematicians who would have been relatively unfamiliar to British readers. 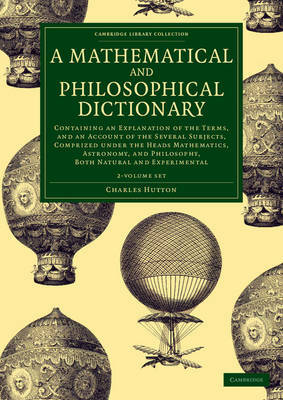 These features make Hutton's Dictionary a particularly valuable record of eighteenth-century science and mathematics. His Principles of Bridges (1772) is also reissued in the Cambridge Library Collection.